Teddy is a 10-12 year old Dalmatian who was picked up as a stray. Despite a myriad of medical issues and what can’t have been an easy last couple of weeks or months based on his physical condition, Teddy has a heart full of love and a tail that never stops wagging. 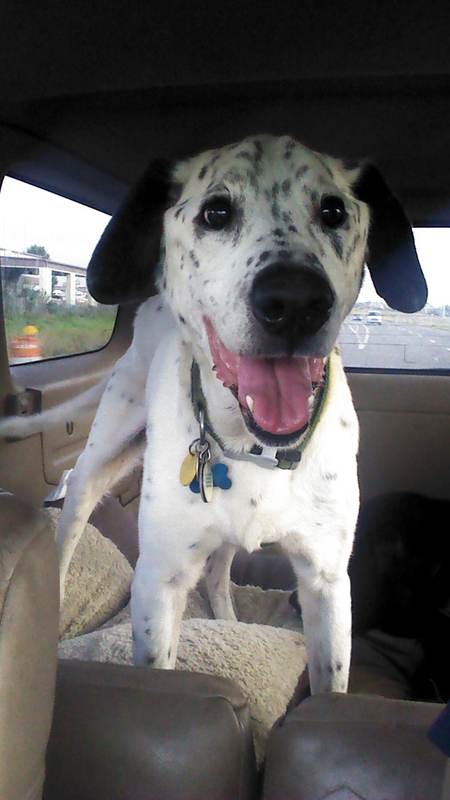 Teddy was being held at a shelter we haven’t worked with before and, while we were figuring out the logistics of rescuing him, we happened to connect with a Dalmatian rescue group through the shelter’s Facebook page. They are in Tampa, Florida, but they wanted to know how they could help. The founder of the Dalmatian rescue group and I got on the phone one evening and, despite what was a seemingly random connection, we quickly discovered that we both used to live in Seattle and we both used to volunteer for Old Dog Haven. What are the odds? Talk about a partnership that was meant to be! We told her we would pick Teddy up and take care of his medical issues if she would reach out to her network of Dalmatian lovers and help us find him a home. We are happy to report that today is the day Teddy started his new life. He is retiring in the Sunshine State with a wonderful couple who have fallen in love with him already. They live in Sarasota, FL, which is 400 miles away, so in order to get Teddy to his new home we needed another round of teamwork. We got up early this morning and drove the first leg and got him to Gainesville, FL, where we met up with a volunteer from the Dalmatian rescue group. She drove the next leg and got him to a small town just north of Tampa, where another volunteer met her and brought Teddy the rest of the way. As we type this he is settling in for the night with his new parents and four-legged brother. Congratulations, Teddy!